BP Gift Cards are easy to buy and easy to use. They are available in convenient denominations and can be used at the pump and inside the store at more than 9,000 BP locations across the country. Treat a friend to high quality BP Fuels with Invigorate, food, car washes and more with the BP Gift Card. National Gift Card is the best place for you to order BP gift cards in bulk. We are the experts in all things gift cards and can set up your gift card solutions program for you today. Please contact us for more information on bulk, direct-to-recipient, or individual gift card fulfillment for your gift card program. Contact us here or call us at 888-472-8747 today! This card may be redeemed for the purchase of gasoline, services and merchandise (except for lottery tickets, money orders, and Prepaid Cards) at BP or Amoco locations in the United States. BP gift cards do not expire and carry no fees. For gift card balance, call 1-800-519-3560. Not available for the following states: California, Connecticut, Massachusetts, Maine, New Hampshire, and Washington. 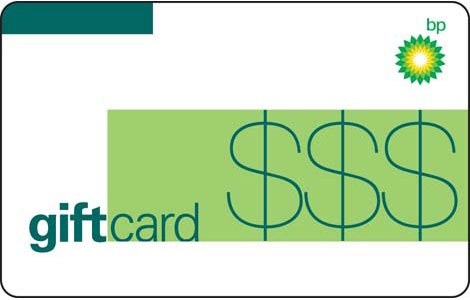 BP Gift Cards can only be used for purchases at participating BP and ARCO locations in the U.S. Use of the BP Gift Card is subject to the terms and conditions printed on the cards. BP is not affiliated with National Gift Card, nor is BP a sponsor or co-sponsor of this promotion. BP will not be responsible for any unauthorized use. The BP name and logo are registered trademarks of BP p.l.c.